Yukikazu(Nyoichi or Jyoichi) Sakurazawa, also known as George Ohsawa (GO), is the proponent of macrobiotics which now has spread worldwide. He was born in Kyoto on October 18, 1893. 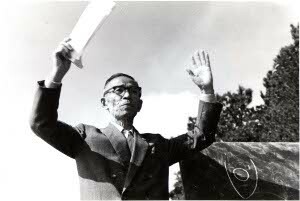 He lived struggling through three periods – Meiji, Taisyo, and Showa – until he died on April 24, 1966 at the age of 74. He was born in poverty and destitution. His father went away home soon after his birth, and his mother and three siblings died of tuberculosis before he turned 15. He himself also came close to death at 17, and then he made miraculous encounter with “Shokuyo” (or dietetics) of Sagen Ishizuka. After mastering the way to become healthy only through foods, GO graduated from commercial high school in Kyoto in 1912. Before long he became well known in the business world working at a trading company while continuing Shokuyo movement. In 1924 he was determined to put his whole energy on Shokuyo-kai (or association) and devoted his life to the popularization of Shokuyo. GO discovered the traditional oriental principle of yin-yang in Sagen Ishizuka’s Na-K principle known as “Fu-fu (or Marital) Alkaline Theory”. This discovery led him to further find possibilities in Shokuyo to make it the sole approach to the spiritual self-discipline toward the universal truth. It got beyond mere simple healthy dietetics. GO embarked on penny-less journey to Paris in 1927 determined to spread Shokuyo worldwide. He studied at the Sorbonne and Institut Pasteur seeking for the better explanation for the oriental principle of yin-yang. In 1931 he wrote in French “Oriental philosophy and scientific Principle of Unique”. The underlying principle of this book was the integration of spiritual culture in the east and material culture in the west. In 1937 GO became the principal of Shokuyo-kai. The monthly magazine “Shokuyo” was read by over ten-thousand people. Living through unsteady periods in pre-war, during-war, and past-war, GO realized macrobiotic thinking and philosophy was the key to world peace and did huge amount of writing, lecturing, educating, and studying to achieve this noble goal. In 1940 he left Shokuyo-kai for further popularization of yin-yang theory “Principle of Unique”. GO set up “Center for Research on Principle of Unique” in Otsu, Shiga, which resulted in transforming traditional Shokuyo movement to his Macrobiotics movement. 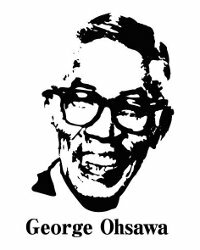 During the war period from 1941 to 1945 GO was well-known earnest peace activist. For one thing he tried to break through Soviet-Manchu border for peace arrangement with Soviet Union. And for another he was arrested because of his protest against the policies of GHQ. 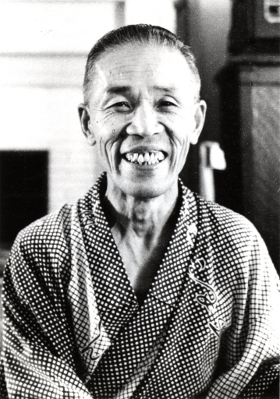 He started “True Life Movement” in 1945 and delivered macrobiotic foods to his fellow macrobiotic people nationwide. As “World Government Movement” GO began educating and sending out many youths to overseas in 1947 for the purpose of further promotion of macrobiotics. GO had always been aware of what was happening in the world. In 1953 at the age of 60 he went to India and Africa for street preaching to teach the local macrobiotics. He confronted a novel peace prize winner Dr. Albert Schweitzer in Lambarene, Gabon in order to convince him of the superiority of macrobiotics. In 1956 GO conducted lecturing at many places in Europe and gained many supporters and advocates. He was bestowed Paris city prize for his selfless services. In the later years he was eager to study transmutation in the normal temperature with a French scientist Dr. Louis Kervran. He was also keen on planning to hold Spiritual culture Olympics where many westerners with high intellect on Japanese culture gathered around. GO died in 1966 without fulfilling his last dream. 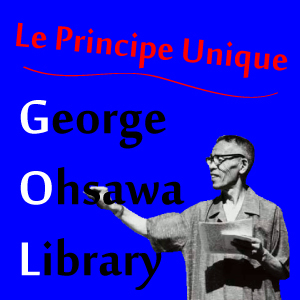 GO wrote more than 300 books. Some of the books were translated into English, French, and other languages. There are a large number of macrobiotic institutes and organizations overseas. GO was also one of the greatest person who influenced natural foods movement in the developed world. Copyright © 2011-2019 日本CI協会　桜沢如一資料室. All Rights Reserved.